Further to my previous post, Fire Engines and other stuff ... some more information as come through after I contacted the Otahuhu Historical Society. Stephen, a commenter at the other post, provided information that the ambulance's remains is that of an pre-war International, which he said belonged to the Otahuhu Railway Workshops. "When the ambulance was retired the Otahuhu Railway workshops staff restored it to immaculate condition then donated it to Motat. After a while Motat put it outdoors into the weeds by the Motions Rd entrance (along with several other desirable vehicles) where it deteriorated and meanwhile used indoor areas for irrelevant Disneyland type things.I last saw it in the weeds a number of years ago but at least it is now back under cover albeit a shadow of its former self." A couple of other images were found here and here. Well -- I emailed Elaine Read who is the newsletter editor for the Otahuhu Historical Society. That Society have a huge collection of information on Otahuhu's history, plus display rooms. If anyone would have more info, they would. And -- I was right. (My sincere thanks to Elaine Read and the Otahuhu Historical Society for all their help). From Otahuhu Courier, 30 November 1966, Otahuhu Historical Society files. Above are members of the Otahuhu Railway Ambulance Division in 1944, alongside the division's main asset, their 1939 International truck altered in 1943 to serve as their mobile ambulance. In 1927, the Railway Department decided to form Railway Ambulance Divisions, and this particular division began as part of the Newmarket railway workshops in June that year. When the workshops were transferred to Otahuhu in 1929, the ambulance division went with them and was duly renamed Otahuhu Railway Ambulance Division. By the early 1930s, the division was able to be uniformed, and during World War 2 they were part of the Emergency Precautions Service. 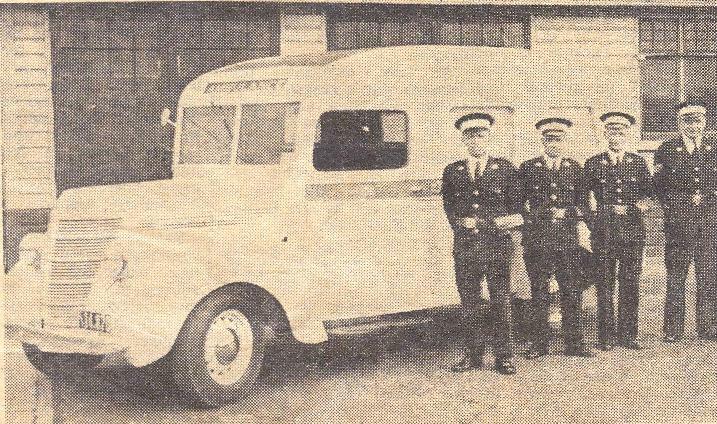 After 13 months of fundraising through voluntary contributions by both the ambulance division members and staff at the workshops, a 1939 International truck was purchased from the army, and converted by the Railway Workshop. The resulting vehicle (above) was dedicated on 13 December 1943 by Canon R J Stanton, in the absence of the Bishop of Auckland. Canon Stanton, according to the division's 21st anniversary booklet from 1948 (kindly scanned and sent through by the Otahuhu Historical Society), "said in his service that he trusted it would never be required in the humanitarian work for which it was intended, but it conveyed a patient within ten minutes of its dedication." From that date to 20 October 1948, the ambulance had travelled 6266 miles, and transported 108 sick and injured patients in 1947 alone. International 1937 D2 pickup. Photo by Ed Roberts. Such a pity that it was allowed to deteriorate. Hopefully, the folk at MOTAT will be able to put things right, so that this part of Auckland's history will once again be able to be appreciated as it should be. They owe it to the men of the Ambulance service to see it back to its former well maintained condition. Great post and great history. As a Sheet Metal worker at Otahuhu for some 26 years I remember this ambulance well. Towards the end of it's life at the workshops it's unreliability became well known and on several occassions workers ran to push start it when it refused to start.